Many of us may run into the complication of receiving a VOB file that our mobile device or media player cannot play. Usually you may get an error message "format not supported", "Error opening file" or "File format mismatch". Instead, you will need a key element, a 2019 VOB converter for Mac, needed to convert VOB to MP4 MOV AVI WMV on your Mac OS for unrestricted playback. There are two essential questions to be given into consideration while choose a right VOB converter for Mac. 1. Will it output VOB file into a large variety of output formats? As is known to all, VOB is not mobile-friendly. Neither iPhone, iPad nor Android will play VOB files. 2. 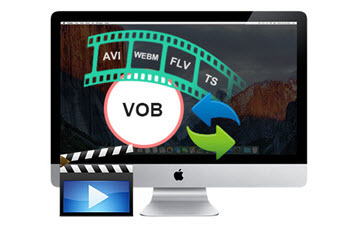 Will the 2019 VOB video converter for Mac compress VOB file to smaller size? Typically, a full-length DVD movie is made up of at least 3 VOB files, with size having 1GB at most per file. If you don't want your VOB files use up your mobile storage space, to shrink VOB file size is needed. 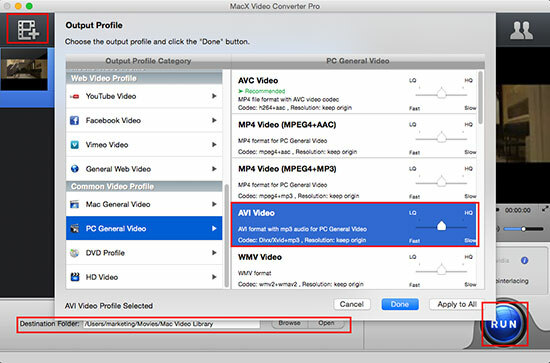 With the two factors in mind, here MacX Video Converter Pro is highly recommended. It is good helper at the time when you have VOB videos that you want to compress them to small-size file format, be it MP4, MPEG4, H264, MOV, AVI, WMV, MKV or MTS. Built-in 350+ device profiles, the 2019 best VOB converter for Mac offers one-stop shop solution for you to convert VOB to Mac, iPhone (XS/XR), iPad (Pro), Samsung Galaxy S9, PS4, and other mainstream devices with a few clicks. 1. Convert SD&HD videos to/from VOB format, with 320+ video codecs and 50+ audio codecs infused. 2. Convert VOB video to iMovie, FCP for further editing. 3. Convert VOB to web video format in FLV WebM for uploading VOB to YouTube, Facebook, etc. 4. Reduce VOB file size, get the favorite part of VOB file, crop it to fit specific device screen via trimming, cropping, shrinking, etc. 5. Choose preferred subtitle tracks or add external subtitles to VOB for better understanding. 6. Download online video from as many as 300 video sites, including YouTube and Facebook. To deal with VOB video conversion on Mac computer. Please do free download VOB converter on Mac computer. If you are running on PC, just get its windows version to suit your needs. MacX Video Converter Pro is compatible with both Mac Mojave and Windows 10. Step 1: Launch it and tap the + shaped button on the main interface to load the VOB file to be converted. This VOB converter for Mac supports batch converting, that means you can add more than one VOB file at once. Step 2: Once the drop-down window pops up, just choose the output format according to your requirement. Generally, you are suggested to convert VOB to MP4 as it is the most device-friendly format so far. Also, you can choose to convert VOB to Mac's Quicktime MOV format, or other specific device as per your needs. Step 3: Click the Browse button to save the output file and hit RUN button to start converting VOB on Mac. 1. You can tweak the parameter settings, e.g. resolution, frame rate, codec, bit rate. Generally, lower the resolution will bring the VOB file size smaller but will result in blurry image quality. 2. It is a Swiss-Army-Knife VOB converter Mac users will be surprising at its powerful video editing features. it's at your disposal to merge multiple VOB files into one, crop it to fit specific device screen, trim it to fetch the favorite clip, etc. VOB is the abbreviation of Video Object, a container format in DVD media. It contains digital video, audio, subtitles, menus, navigation contents, and info of a DVD movie. For unencrypted VOB file, a player of generic MPEG-2 files, such as VLC, MPlayer, etc can deal with VOB playback. But in some cases, VOB files can be copy protected, resulting in difficulty in playing VOB files. But you can still rely on some trustworthy media player such as 5KPlayer as it can handle the encrypted DVDs and video files with ease. If you want to watch your favorite VOB files on your smartphone, you first have to convert it to an appropriate format as is mentioned above with a VOB converter for Mac.